Co-workers can be so cool My Miki’s Loot! Today was a day that definitely called for chocolate. 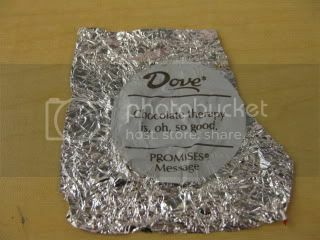 I had one more Dove Dark chocoloate sitting on my desk from my co-worker that spoke to me. OMG ~ how true is that?! It definitely made me feel better as I was working away. 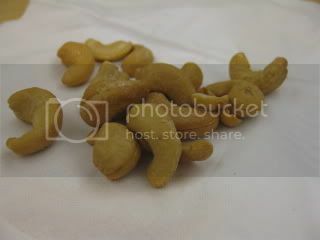 Later on I had a real snack of some TJ’s cashews x’s 2. I had my second round about 6 pm since I was still working away and my tummy was rumbling. When I came home The Husband declared he wanted cereal for dinner. How can your argue with that…so he proceeded to eat a 1/2 a box of Lucky Charms (~ 14 oz!) I wasn’t feeling cereal so I took some leftover Chive Buttered Noodles and topped them with leftover mushroom sauce. All mixed up it looks just like Beefless Stroganoff. This was soooo good – I think almost better the next day. 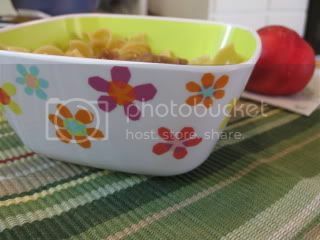 In a fun bowl with a nectarine because fun bowls make me HAPPY! So I promised you all last night to tell you about the super cool goods one of my co-workers gave me yesterday. 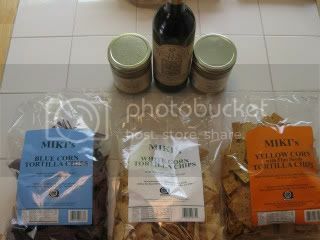 Her family own’s a local Gourmet Food Company and they have some fantastic products that they make. 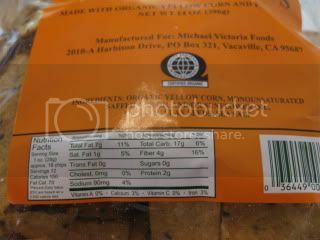 They were nice enough to bring me THREE bags of organic corn chips, two jars of Sweet & Spicy Mustard and some super fancy Organic Extra Virgin Olive Oil!!! 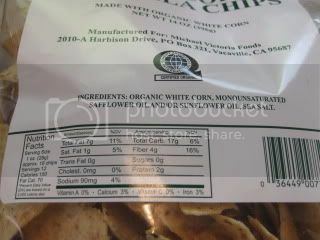 Check out all the ingredients and nutritional specs on the corn chips ~ they are 100% Clean Eats! 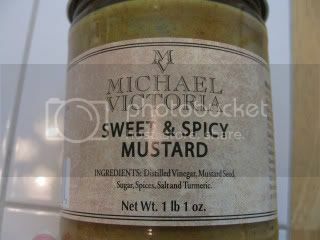 My absolute favorite type of mustard too ~ Sweet and Spicy. I cannot wait to dig into this! 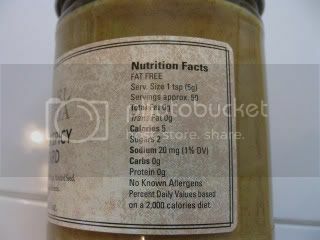 This is why I LOVE mustard ~ even with ALL the flavor in sweet & spicy versions – there is still barely any calories. 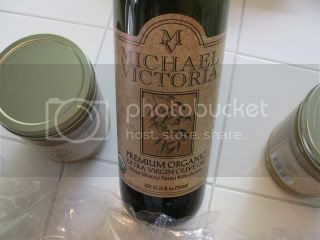 I LOVE Olive Oils too because they are healthy fats when used in moderation. A little bit goes a long way. I bet this is fantastic drizzled over pasta and dipped straight up with bread. I will find out all the places their products are sold at so you can check them out. I know she mentioned Whole Foods. Locations and reviews coming soon! Maybe I can dip my new chips in some Fire Salsa ~ MMMMMM….chips+salsa = LOVE! I also think I might need to host a giveaway to share ~ whatcha think? Alright all ~ I am beat….off to get a little caught up and then hit the hay so I can get up for another early morning workout. It’s time to get back into the groove! Don’t forget to click HERE to get some Holey Donuts! « Thai Kitchen ~ Why haven’t I eaten more Thai?! i love mustards and that sweet and spicy sounds awesome! 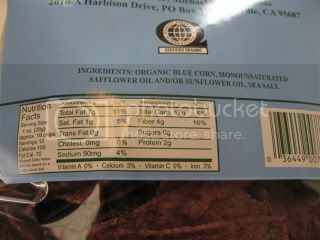 blue corn chips are my favorite, too, but those flax seed ones sound good! 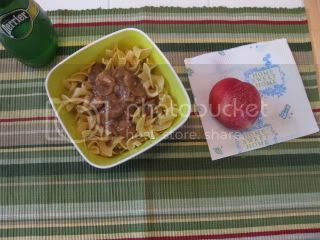 Stroganoff is one meal that I haven't had since going vegetarian but I miss it! I need to make it like yours – comfort food!! What a great co-worker! I love people who share!! ohh all that food looks so yummy, fun that you got to try it! yes do a giveaway haha! Brandi ~ I completely agree with you – they all sound good. 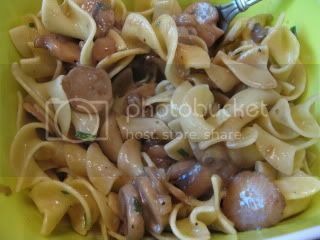 K ~ You should totally try it – this was tasty and easy! Anne ~ I cannot wait to dig into the mustard. Fatfighter ~ Me too – they are so rich and creamy. I am a sucker for little messsages too. Theangrydieter ~ Me TOO! That's why I think I need to have a giveaway to share with you all too!